Ok thank s very much....when you decide let me know what you would want with the post.I'm mainland Uk. Barry. Please can anyone point me in the direction of an Indian made Solex carb for the Hotchkiss. Were always some on e bay,but as usual,when you' want one it's not there. Thanks in advance. Yes I know ...that's why I said "latest spec"
Well more interested in WW2 really Chris ,and depends on what's missing.Thanks for the reply. Barry. WANTED....De Act in rough condition for refurbishment.Must be cheap,and latest spec with cert of course. Thanks in advance. Barry. Please has anyone got a deact that's not too much money...don't mind something rough/poor cond. Obviously must have de act cert. Many thanks in advance. Wondered if anyone had experience of Hotchkiss 24 volt not charging.Tried everything ....brushes all good and free....but still no luck.I have a feeling it may be regulator but not sure.In 15 years of owning it I've not known of a fuse related to charging ?? Would appreciate anything that may be useful.Thanks in advance. 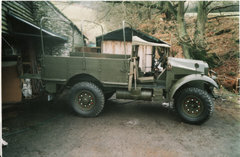 Morris Commercial CS8 ...the one from Dads Army Movie. There is only one Dads Army Movie...it is the actual one,I restored it several years ago from an absolute basket case.It took me over 2 years.They are extremely rare now with under 20 surviving.There are C8's and C4's in more numbers. Hollywood purchased thousands of WW2 vehicles for films and wrote them of after filming,there were so many around at the time. Rifle Bolt wanted please for a Steyr Mannlicher 1886 rifle....or anything that I could adapt for display purpose. Would consider anything that you may have lying around,spare or damaged. Also interested in a de act ,if it's cheap !! Thanks in advance. Look on e bay,they are the same carbs...made in Hong Kong/China and superb quality. Hi Clive...should I fit any specific condenser on my Hotchkiss 24 volt please....can't seem to get her running right.Many thanks. Hi all....on a Hotchkiss 24 volt system,does it make a difference what condenser is used ?....thanks in advance. For my MJ,I bought a digital temp gauge off e bay for £3.99 (actually an aquarium temp gauge) it goes up to 120 deg C Drilled a tiny hole in a hose and pushed the probe in.It was Araldite'd and left in....was absolutely brill. I always had piece of mind on the temp.